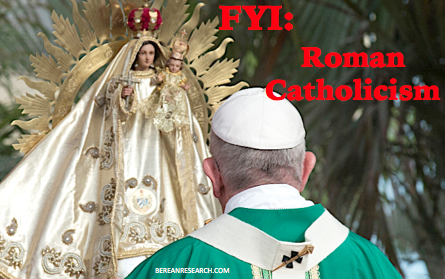 The Roman Catholic Church (RCC) claims to be the one true Church as established by Jesus and His apostles. However, an examination of the doctrines upheld and taught by the RCC demonstrates that it stands in contrast with – and even in opposition to – biblical Christianity. Though not exhaustive, the following overview analyzes and compares some of the core tenets of the Roman Catholic tradition with Scripture. Canon 14: If anyone says that man is absolved from his sins and justified because he firmly believes that he is absolved and justified, or that no one is truly justified except him who believes himself justified, and that by this faith alone absolution and justification are effected, let him be anathema. As the perfect sacrifice for the sins of men, Christ’s death and resurrection provided salvation for all who would believe. Salvation is the forgiveness of sins and the saving from the wrath and condemnation of God. Salvation is by grace alone through faith alone in Jesus Christ alone (Eph. 2:8-9). Salvation is a free gift from God to those who believe (trust) in Him (Rom. 1:16; 6:23; Eph. 2:8-9). The Lord’s Supper, or Communion, is celebrated in remembrance of the sacrifice of the Lord Jesus Christ, and in obedience to His words (Lk. 22:19–20; 1 Cor. 11:23–26). Jesus Christ was sacrificed only once for the forgiveness of sins of all those who will believe (Heb. 7:26–27, 9:28, 10:10–12). This single sacrifice was sufficient to save for all time those who are being sanctified (Heb. 10:14). The sacrifice of Christ on the cross is what makes propitiation for the sins of His people (Heb. 2:17; 1 John 2:2). Scripture clearly teaches that “in Adam all die” (1 Cor. 15:22) and that no man is righteous or without sin (Rom. 3:10–18), with the exception of Christ Himself. “If we say we have no sin, we deceive ourselves, and the truth is not in us (1 John 1:8). If we say we have not sinned, we make him a liar, and his word is not in us (1 John 1:10).” Thus, Mary, like all mankind, was a sinner. Scripture indicates that the Lord Jesus had brothers and sisters (Matt. 1:24–25, 12:46–47, 13:55; Mark 6:2–3; John 2:12; Acts 1:14; 1 Cor. 9:4–5; Gal. 1:19). The only One who acts as a mediator between man and God is Jesus Christ. He alone is the high priest (Heb. 5:5, 6) who offered His own blood as an acceptable sacrifice for the sins of those who would believe (Heb. 9:14–15, 10:14). When man’s tradition contradicts Scripture (as many of the traditions of the Roman Catholic Church do), then it must be rejected (Mark 7:8–9, Col. 2:8). “All who die in God’s grace and friendship, but still imperfectly purified, are indeed assured of their eternal salvation; but after death they undergo purification, so as to achieve the holiness necessary to enter the joy of heaven. The idea that men must atone for their own sins, whether in life or death, runs contrary to the doctrine of justification by grace alone through faith alone, and denies the full efficacy of the penal substitutionary atonement of Christ. Christ’s sacrifice achieved the salvation of all who will believe, apart from any work or merit of their own doing. Purgatory is not a Scriptural concept. Scripture does speak quite clearly, however, about the two possible destinations after one’s death: Heaven or Hell (Matt. 25:31-34). The teaching of indulgences negates the sufficiency of Christ’s work on the cross. Christ alone has born the punishment for the sins of those who will believe (Rom. 5:1, 9; Eph. 2:8; Isa. 53:4-6). The deeds of men are as filthy rags before God (Isa. 64:6), and thus the Christian can only be reconciled to God by grace through faith in the person and work of Jesus Christ (Rom. 3:24, 5:1, 11:6; Eph. 2:8). The perfect life, death and resurrection of Christ was accomplished in full so that man would no longer require another mortal mediator between himself and God. Sinful man, through Jesus Christ alone, can now approach the throne of God (Heb. 10:19–22, 4:16). Please see the list of ‘Further Reading’ below for additional discussion of the interpretation of Matt. 16:18. Note: Christian Research Network wrote a research paper on Roman Catholicism. Berean Research has obtained permission to extract some of the information and present it here. The original can be found on CRN.